It's holiday time, and most of us are either busy with kids at home or visiting family and friends. We are in Singapore now, visiting my sister's family and some old friends and I am having a wonderful time with my 2 year old nephew, and very little time to spend on the blog. I had wanted to schedule my posts, back in India itself, but it didn't work out, at least I had edited and uploaded these pictures there, so I could do a post today. 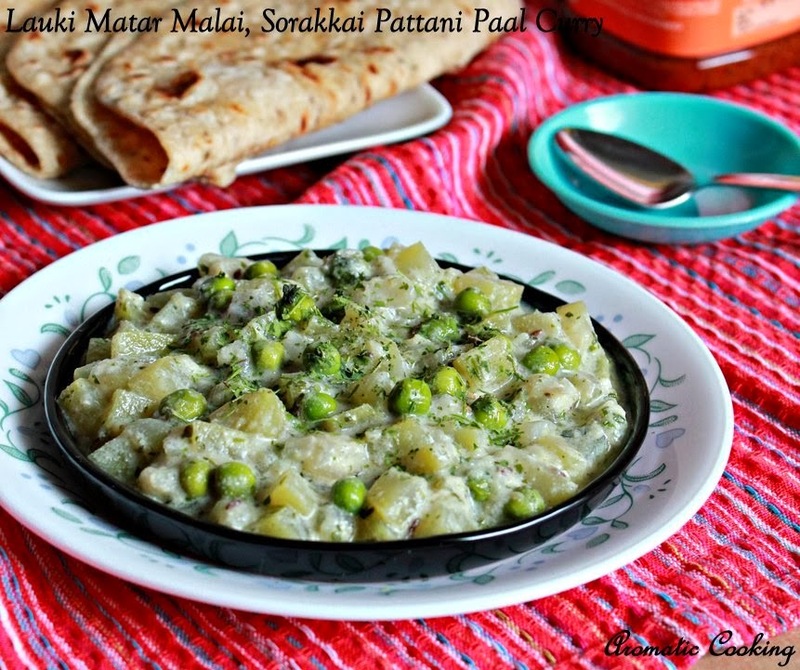 Today's dish is Lauki Matar Malai/ Bottle Gourd And Peas Milk Curry, it's a slight variation from Methi (Fenugreek Leaves) Matar Malai. The curry goes well with rotis or any kind of pilaf, absolutely delicious and very different from the regular dals or curries that we make with bottle gourd. Even though malai means cream, it's not very rich or loaded with calories, I have used only low fat milk here and the flavor from kasuri methi is too good.. Grind together all the ingredients given under ' to grind '. Microwave the green peas with some salt and keep. Heat some oil, add the cumin seeds, once it starts sizzling, add the onions and saute till it turns translucent. Then add the ground paste and saute for another 4 to 5 minutes, till the raw smell of garlic and onion goes away. Sprinkle some water if the paste sticks to the pan and keep mixing. Add the curd and keep stirring till it's well mixed with the masala. Now add the chopped bottle gourd, some salt and 1 cup water, mix, cover and cook on low heat till the vegetable is cooked. Add the cooked peas and pepper powder, mix and cook for another minute. 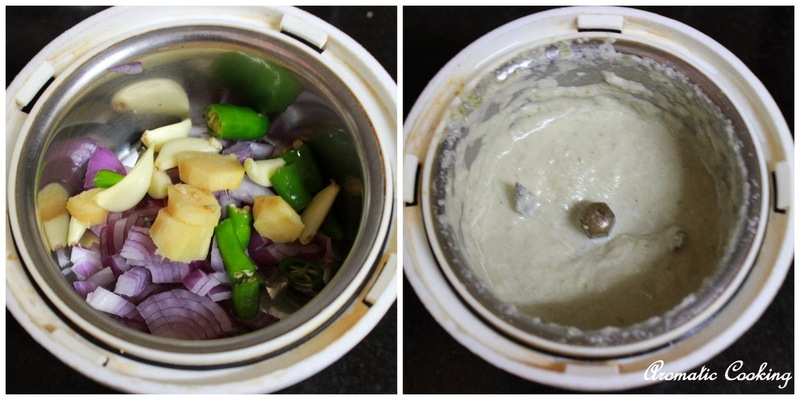 Then add the milk, cardamom powder and the kasuri methi, mix and simmer for another 5 minutes and switch off. If making for a party, you can make the curry a little more richer by adding some fresh cream along with the milk. 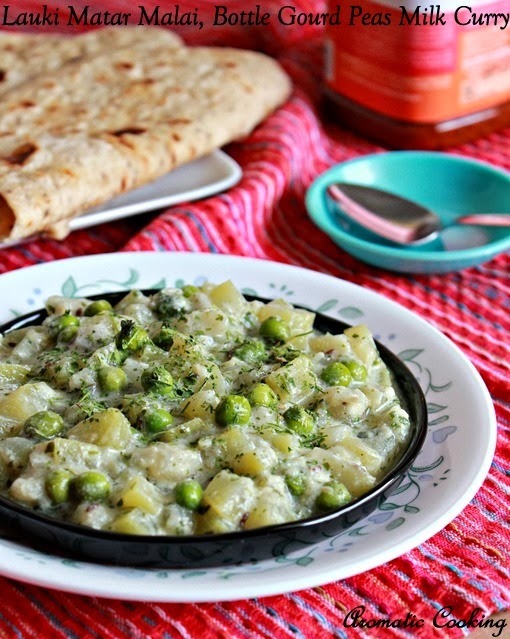 You can cook the peas along with the bottle gourd, but cooking it in the microwave retains the green color. A very flavourful and delicious veggie curry, Hema. Loved it! It is truly different from the normal lauki curry. Hema, enjoy your holidays. Comforting and delicious curry.. yummy!! Thats a healthy and creamy curry. yummy curry!! love the white based gravy rather than the usual tomato base! !